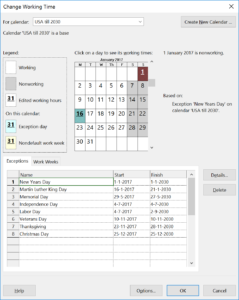 What are Microsoft Project workdays? What can we change, what should we change and where do we change it? This blog post will talk about what you can expect with certain changes in the workdays settings, as well as some advice on what to do and what to leave alone. Granted that some advice might not apply to your specific situation. A normal workday is 8 hours, from Monday till Friday, will start at 8 AM and end at 5 PM, and will include 1 hour break starting at Noon. This is the situation when you are using Microsoft Project right after installing, without any changes to the items mentioned in the next paragraphs. To give a task a duration of 1 workday you enter the value in the Duration column, entering 1d or 1day will be enough. MS Project is a work application and will not place tasks in the weekends by default (more on that later). Microsoft doesn’t include country bound or specific holiday’s into the product out of the box. Your country might have very specific days that you would like to take into account that the US don’t have and vise versa. That’s why you need to create your own calendar for the project(s). The 24 hour calendar is the ideal solution when it is set as the resource calendar for machines in a factory. Those baby’s will keep working non stop if you want them to. The Night shift calendar isn’t very useful in my opinion. Most times when a client had specific crew’s working night shifts the hours wouldn’t represent a 40 hour work week. And they wouldn’t include a break for 1 hour either. 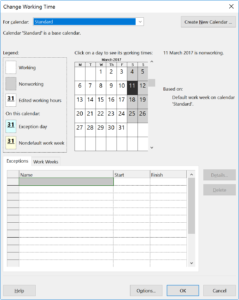 The menu isn’t called “Change calendar” for a reason and that is because the menu includes the option to change the hours within workdays as well. I would advice creating a new calendar, rather than overwriting or using one of the defaults (you never know when you’ll need them again). To create a new calendar click on “Create new Calendar…” in the top right of the menu. You can now choose to create a base calendar or create a copy of one of the 3 defaults. I would advice doing the later. Exceptions are unique moments in time that will represent nonworking time. “Unique moments in time” should be read as not every Monday or not every other Wednesday. Examples are Labor day, or the first day of the new year (at least in The Netherlands this is a holiday). Work Weeks give you the option to change the default work week. By for instance changing the Monday to a non working day and the Saturday a new workday. 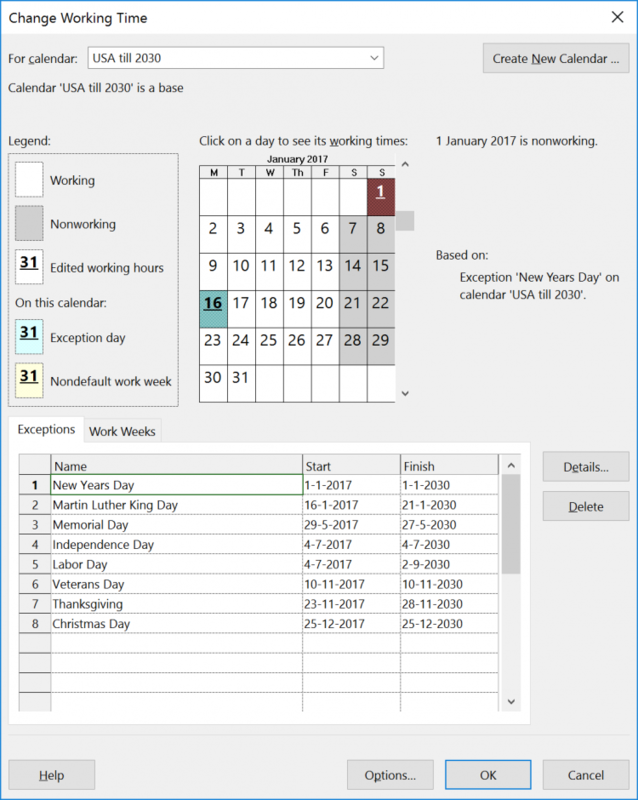 Changing the workdays in MS Project is useful when there is a period in time where a person works less hours and returns to a normal work schedule after that time. To accomplish this you would create 2 workweek schedules and save the values. A change on a more detailed level can be achieved in the Options – Schedule menu. A word of caution, Changing these values will effect schedules only if you match it with the Calendar (as stated in the warning text next to it). And it will also effect the Golden Formula in MS Project for calculating assignment actions. If you change the normal workweek or month, it might effect your tasks duration substantially. Do some testing with this on a small project before rolling out changes to production! 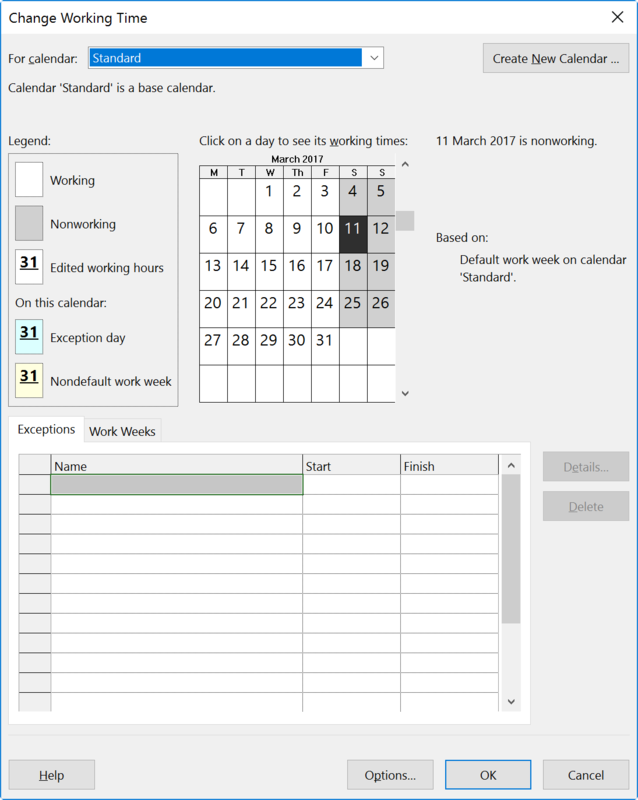 That’s it for now, hope this post has helped you in better understanding Microsoft Project and how Project calculates workdays. In a recent post I introduced the TPC newsletter. And as an incentive for you to sign up I have created a US holidays calendar that will help you out till 2030 with the basic holidays in the US. I might have missed something (I’m not an American) if so please let me know and I’ll change the file. And a very special “Keep your eyes on the blog” because next post will be post #100! So proud, and thank you all for the support and clicks and reading and sharing. Hope to see you all next post.